Happy Earth Day! Today marks the 45th anniversary of Earth Day and it's a good time to think about how we can live green and help our planet. Things we can easily do are to be mindful of energy use, reduce paper waste by going paperless, recycle, use our own shopping bags and support eco-friendly brands that use natural, organic ingredients and sustainable, ethical manufacturing practices. 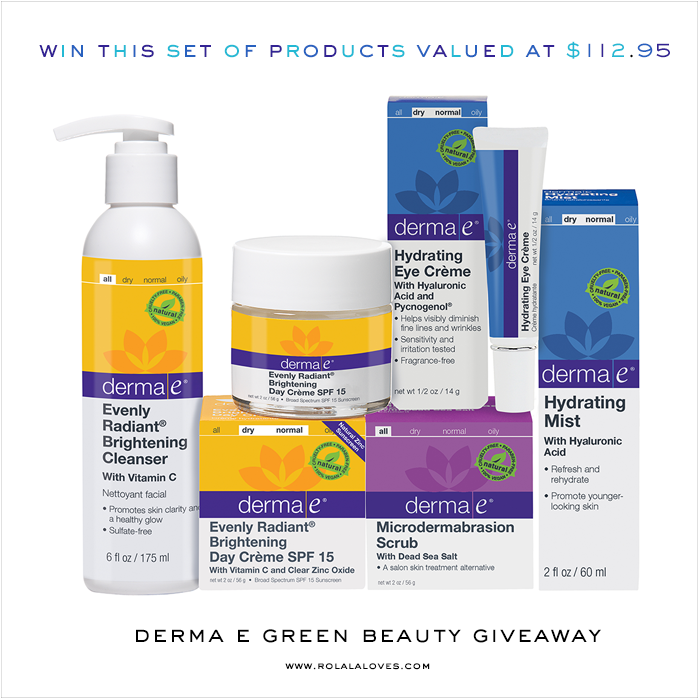 derma e is one such brand and I'm partnering with them for this green beauty giveaway. derma e is a family owned and operated company of 30 years that has pioneered the development of vitamin-rich, high performance antioxidant skincare solutions. Their award winning line features over 80 doctor developed, clinically tested products that are formulated without parabens, phthaltes, sulfates, lanolin, mineral oil and petrolatum. derma e products are also 100% vegan, cruelty-free, gluten-free and GMO-free. This skin-brightening, sulfate-free facial cleanser is formulated with an intensive skin brightening complex containing Madonna Lilly Pant Stem Cells, Bearberry, Niacinamide, Green Tea and C-Ester. It helps to promote skin clarity and glow and is ideal for skin with signs of uneven pigmentation, discoloration, sun damage, freckles, age spots and dark spots. This lightweight daytime moisturizer contains an intensive skin brightening complex with Madonna Lilly Pant Stem Cells, Bearberry, Niacinamide, Licorice, Green Tea and C-Ester to help brighten and even skin tone. Clear Zinc Oxide provides chemical-free and nanoparticle-free broad spectrum UVA/UVB protection. This best selling fragrance-free eye crème hydrates, firms and tones the delicate eye area while reducing the appearance of fine lines and crow's feet. Hyaluronic Acid (known as nature's moisture magnet) is blended with Pycnogenol , Green Tea, Jojoba Oil and Vitamins A, C and E to create a rich, replenishing formula. This award-winning, salon treatment uses an exclusive crystal blend that includes Dead Sea Salt, Silica-rich Volcanic Sand, Lime and Lemon Peel, Grapeseed and Vitamin E to gently buffs away dull surface cells to help diminish the appearance of fine lines, wrinkles and acne scars. This refreshing mist instantly rehydrates dry skin on the face or body with a blend of Hyaluronic Acid and antioxidant Green Tea and Vitamin C to combat environmental stress. It is packaged in a convenient portable spray pump to take on the go. This is giveaway is open to US residents only. It starts April 22, 2015 and ends on May 3, 2015. Entries will be verified for eligibility. One winner will be randomly selected. You can enter through this link or the Rafflecopter widget below. The widget acts up sometimes so if it doesn't load on this page, just click through here for it. Good luck! Thanks for all the lovely comments on my last post. I'm glad I'm not the only one who feels that way about feet and pigeons. Yes being able to switch off my sense of smell can come in handy. Some of you were curious about how I can do this. Well I stuck a nail up my nose and punctured it as a kid and after it healed, I found I was able to stop myself from smelling at will. Kinda weird I know. Hi Rowena, I know this brand. Their products are great. I wish I could enter. Good luck everyone! I never heard of the brand doll the giveaway link did not open. This brand must be so excellent and their products inspire me a lot. Id be curious to try the moisturizer and the eye cream. 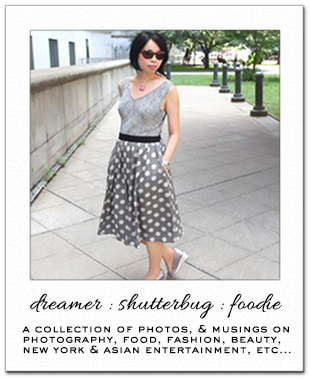 great brand and a great giveaway! I haven't heard of this product but I love C-Ester! I also like that they are vegan and cruelty free! All companies should take notes! I'm really interested in the Brightening Cleanser, anything that claims to brighten I feel I need to try lol. Also the Microdermabrasion Scrubs has some fantastic ingredients, I'd love to try that also. oooo what a great giveaway!! Oh this sounds like an amazing giveaway. I have never heard of this product line, but I'm definitely interested. Great post. Great giveaway...sounds like wonderful products! What a great give-away and these products sound wonderful. And it is nice that it is family owned. I would enter this, but all I really want is the microdermabrasion scrub and that seems unfair to everyone else, lol. Sweet Earth Day giveaway! Love the fact these products are "green!" lovely giveaway..I hope your week is up to a good start. I am most excited to try the Derma e scrub, i think this would help give me a deep clean and leave my skin refreshed and renewed. I haven't tried derma e, but the products sound fantastic! All of their products sounds great!! Anything brightening is always a good thing in my book! I won the last giveaway, so I won't enter. These products look awesome! Making a note :) Good Luck Everybody! I'm most interested in winning derma e Evenly Radiant Brightening Day Crème SPF 15. I need a good moisturizer. I would love to try the Hydrating Eye Crème with Hyaluronic Acid because my eye area is really showing signs of aging. I'm most interested in the Evenly Radiant® Brightening Day Crème SPF 15 because I need a moisturizer with spf in it. I'd love to win the microdermabrasion scrub because my skin has been so dull looking lately. I would like to try the Evenly Radiant® Brightening Day Crème SPF 15 because it has SPF in it and I've heard that Vitamin E is really good to use on your face. The Microdermabrasion Scrub is the product I'm most excited about as I'm utterly obsessed with facial exfoliation. Thank you for the opportunity! I am most interested in the microdermabrasion scrub to see if it helps with acne scars.